Alaska Sens. Lisa Murkowki and Dan Sullivan were both at the Alaska Federation of Natives convention Oct. 16, at the Denai’na Center in Anchorage when U.S. Interior Secretary Sally Jewell dropped her bombshell. Without notice to the state’s two senators or state officials Jewell announced she would cancel two planned Arctic Outer Continental Shelf lease sales and deny requests from Shell and other companies to suspend their Chukchi Sea and Beaufort Sea leases. Those expire beginning in 2017, the clock having been nearly run out mainly due to environmental lawsuits and regulatory delays and before the companies have had a chance to drill more than Shell’s one 2015 well. “The announcement is another sign that the administration has caved into the demands of extreme environmentalists,” the senator said in a statement. “In cancelling these leases, the president and secretary have ensured that Alaska will not be at risk from the dangers of offshore drilling, that one of the last remaining pristine wild places (the Arctic) will not be sacrificed for the sake of corporate profits,” the Sierra Club said. In her statement on the lease sales Jewell cited Shell’s decision to quit its Arctic program after disappointing results on one Chukchi Sea well and apparent lack of industry interest in lease sales planned for 2016 and 2017. “The administration cites lack of commercial interest and lack of a plan for commercial development, but that justification is duplicitous at best. First the administration creates regulatory obstacles under which success for any company would be nearly impossible. And then it creates lack of commercial interest as justification for locking up the resources,” the senator said. The president’s concerns for social and economic problems in Alaska’s rural northwest villages now ring hollow, Sullivan said, because the economic stimulus and jobs that offshore oil development would have brought in the long term to small coastal communities will be delayed for years. The biggest cause of rural social problems and suicide is lack of jobs and economic opportunity, the senator said. State Rep. Ben Nageak, a Democrat from Barrow who got to talk with the president during his Alaska visit, was dumbstruck by the lack of courtesy by Jewell not giving Alaska leaders a warning of the announcement. “No advance notice. No communication. No respect,” Nageak said in a statement. Nageak was also at AFN when the news was announced. The convention was uplifting, but Jewell’s announcement, “was like taking the air out of the room,” he said. He credited Shell for “offering new avenues of employment and training for our young people. They contributed greatly to our economy,” while drilling this summer, he said. In her announcement Jewell said companies had expressed no significant interest in the two upcoming lease sales, Chukchi Sea Lease Sale 237, scheduled for 2016, and Beaufort Sea Lease Sale 242, scheduled for the first half of 2017. Even before Shell made its decision to leave there were no nominations for tracts to be offered by industry for the Chukchi lease sale and only one expression of interest in the Beaufort sale, Jewell said. As for the lease extensions, Jewell said the U.S. Bureau of Safety and Environmental Enforcement, or BSEE, had concluded that, “the companies did not demonstrate a reasonable schedule of work for exploration and development under the leases, a requirement necessary for BSEE to grant an extension,” Jewell said. 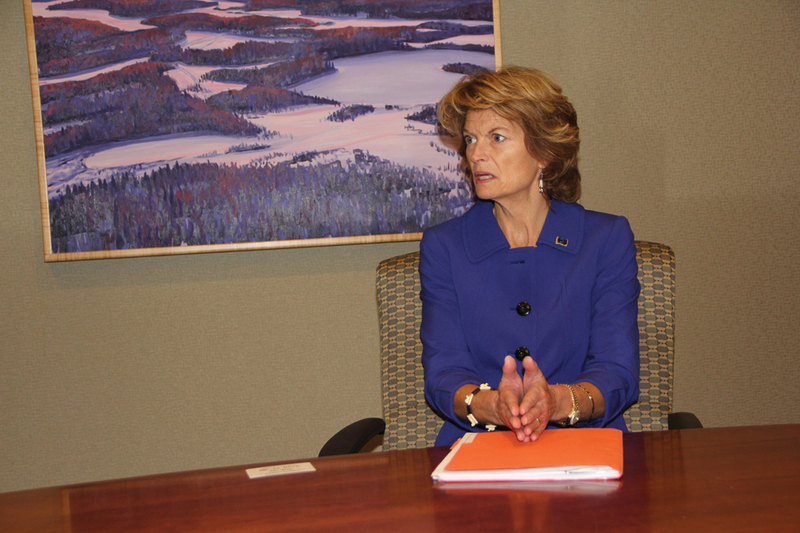 Murkowski was interviewed by the Journal of Commerce two days before Jewell’s announcement, and expressed hope the leases would be extended and the lease sales kept on track. Murkowski, who chairs the Senate Energy and Natural Resources Committee, said she was worried about the lease extensions because the companies had “heard absolutely nothing” from Interior about their requests, which had been made in 2014. “There was no communication, nada,” Murkowski said in the interview. The senator acknowledged that with Shell out of the game there are those in the administration who will question whether there is a need for lease sales. “I think the opposite is the case. We need to assure anyone who is even slightly considering exploration that they will have an opportunity,” to drill, Murkowski said. The senator said she had met with Jewell recently to stress five points on oil and gas development: to approve ConocoPhillips’ GMT-1 project in the National Petroleum Reserve–Alaska; to approve Hilcorp Energy’s application to develop Liberty, a nearshore Beaufort Sea project; to extend Shell’s leases; to keep the 2016 and 2017 OCS lease sales on schedule, and to allow for Alaska OCS sales in a new five-year OCS plan. Jewell’s Oct. 16 announcement knocked two items off that list.